My good friend, the talented author Alli Sinclair, invited me to join this fun blog tour, where we introduce characters from our stories and books. My guy is a police detective from a short story published last year. I enjoyed hanging out with him so much, I’m now planning to give him his own novel. 1.) What is the name of your character? Johannes Christian Alexander Freiherr von Maibeck. I know, it’s a bit of a mouthful, especially for a police detective in Communist East Germany. But if history had turned out differently, he’d have been a baron like his father (that’s the Freiherr part of his name). Since being stripped of his title, he is known simply as Alexander Maibeck. Certain associates (not his friends) call him “Baron,” but never as a sign of respect. 2.) Is he/she fictional or a historic person? He’s fictional, but the story he appears in is set against the backdrop of real events. 3.) When and where is the story set? 1981, Leipzig, German Democratic Republic. 4.) What should we know about him/her? Maibeck is a detective with the Leipzig Volkspolizei. He’s in his late forties, divorced, the father of a rebellious teenage daughter whom he adores. Their relationship is strained, however, because of what he does for a living. Like most of her friends, she views the police as the enforcers of an oppressive regime. Maibeck has worked hard to overcome the political liability of his aristocratic birth—at the expense of his family life. Once a committed Communist, he has become disillusioned with the ideology and the course his country has taken in recent years. 5.) What is the main conflict? What messes up his/her life? While political unrest is raging in neighboring Poland in the form of protests surrounding the Solidarnosc (Solidarity) trade union strikes, a nocturnal graffiti artist is spray-painting slogans in support of the Polish strikers all over town. The East German authorities are desperate to catch the vandal, convinced that his messages are coded calls for an uprising. When Maibeck’s daughter, Katya, is arrested for smuggling subversive documents across the border and comes under the power of the brutal secret police, Maibeck must capture the elusive artist to secure her release. But if he is successful, will Katya ever speak to him again? He must choose between her life and her love. 6.) What is the personal goal of the character? All Maibeck has ever wanted was to fit in. Always the outsider, his yearning compelled him to divest himself of his aristocratic heritage. But now, later in life, he’s come to realize that he will always be viewed with suspicion by his Communist comrades, and his refusal to accept who he is has ruined his chances of a stable and happy family life. 7.) Is there a working title for this novel, and can we read more about it? Trading Places was published in Nautilus, an online magazine. You can read the story for free here. 8.) When can we expect the book to be published or when was it published? The authors below are next up on the tour. They will each be writing about a character from their books on October 22, so be sure to stop by their blogs next week! Diana Chambers was born with a book in one hand and passport in the other. Maybe it was A Tale of Two Cities, but she was soon wandering Paris cobblestones. An Asian importing business led to Hollywood costume design, then scriptwriting…until her characters demanded their own novels. She writes romantic intrigues set in far corners of the world. Her first Nick Daley thriller, Stinger, was recently released by Audible.com, with the sequel in production. Diana loves spicy foods and her bag is always packed. She is a member of Writers Guild of America, Mystery Writers of America, Romance Writers of America, and Sisters in Crime-NorCal board. dianarchambers.com, facebook.com/DianaChambersAuthor, twitter.com/DianaRChambers. Kate Wyland writes romantic suspense novels, usually in a horsey setting and often with a paranormal twist. Her novel Forewarning recently placed third in the PRG Reviewer’s Choice contest for Best Mystery/Suspense, while Wyoming Escape came in fourth. Kate is a life-long horse nut who started riding at three years old and has taken part in a variety of equestrian activities. A few years ago, she exchanged her tech writing “bug” hat for a fiction writing Stetson. She delights in combining her love of animals and country living with her fascination for mystery and suspense. 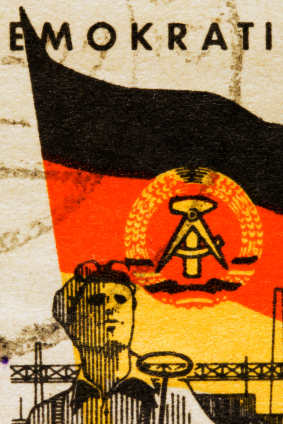 This entry was posted in Germany, Stories and tagged GDR, Leipzig, politics. Bookmark the permalink.